Are you looking for a little Spring science inspiration for your child? Why not study rainbows? 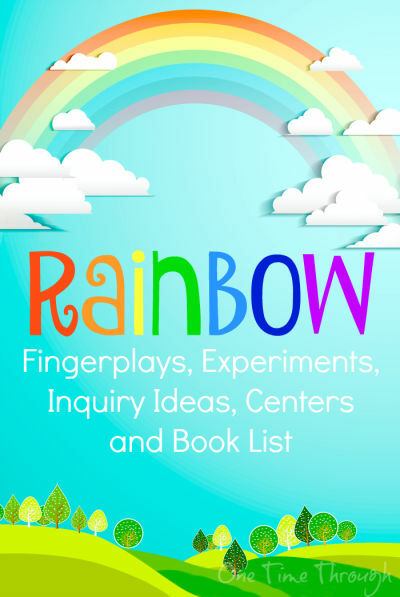 I’ve got a brand-new rainbow fingerplay today you can print out and do with your young child, as well as a list of fantastic rainbow books perfect for inquiry with kids of all ages, as well as some links to fun hands-on rainbow experiments to try. When starting to learn about something with Onetime, I usually like to either read a book together, or do a quick hands-on activity. We spent some time trying to make rainbows at home one day. 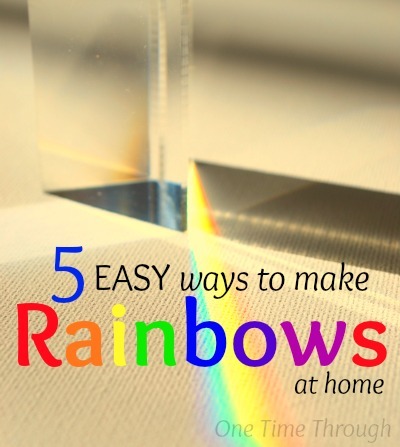 Try one of these 5 fun ways to make a rainbow and then read one of the awesome rainbow books together from my list below. Don Freeman’s A Rainbow of My Own is the fictional story of a boy who ventures outside after a rainstorm to try and find a rainbow. When he fails – he imagines a rainbow of his own to play with. In the end, when the boy returns home, he finds the sun has made a rainbow inside his house from his goldfish bowl! Recommended for preschool to grade 2. Each page has a cut-out for each colour and in the end they combine to make a fold-out rainbow. It has lots of levels of meaning, and is a fun conversation starter. Light: Shadows, Mirrors, and Rainbows (Amazing Science) by Natalie M. Rosinsky – A non-fiction book for young readers with the science behind light and rainbows. Curious George Discovers the Rainbow (Science Storybook) – Who doesn’t love this adorable monkey? In this new Science series, George learns all about the science behind rainbows with all the fun of his usual escapades! Recommended for grades KG to 2. The Rainbow and You – If you can find a copy of this book – it has amazing reviews! It sounds like a fun picture book with Roy G. Biv as the main character who takes the reader through the science behind rainbows, while exploring different culture’s rainbow myths and beliefs. Recommended for grades 1 to 7. What does your child already know about rainbows? Whenever we start some research together, I like to first have my son tell me what he thinks he knows about something. I call these our “THINKS” and we usually write them down on brightly coloured sticky notes. Then we talk about our “WONDERS” (Aka: our questions!). If your child can write on their own, you can give him or her a sticky note to record their THINK and another to record a WONDER that they have. If they are not proficient yet at writing, just scribe a number of their ideas onto separate stickies. We keep our sticky notes in our science journal at home. Now is a good time to read and explore hands-on activities to try to confirm whether your child’s “thinks” are correct (Yay! We were RIGHT!) or to update our thinking (We no longer believe this) and add new understandings. 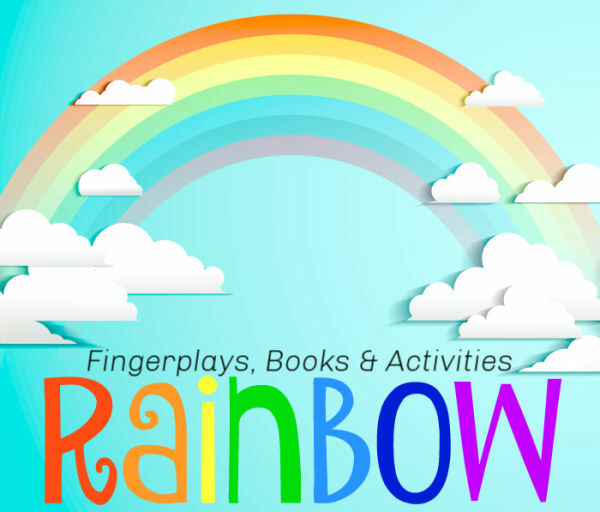 After a little hands-on research, you can try my rainbow fingerplay! 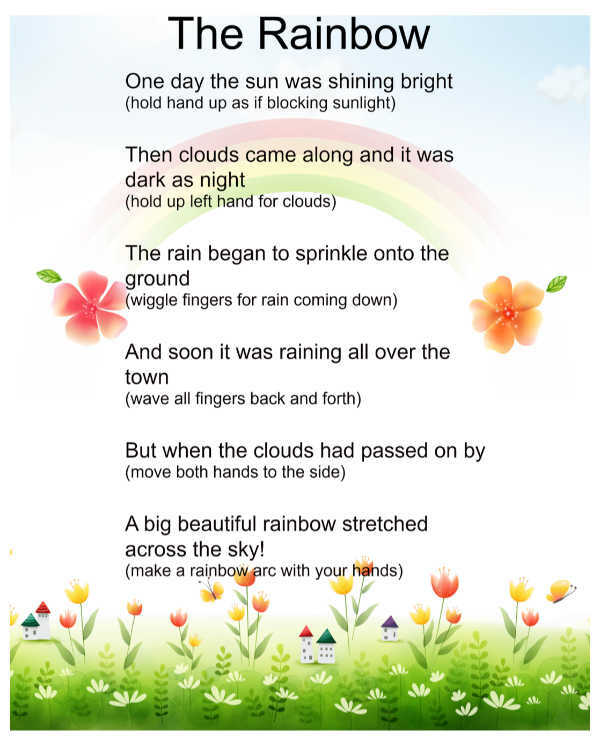 Download the Rainbow Fingerplay PDF HERE. Looking for even more fun rainbow activities? Check out these other fun posts! Do you have any fun ideas for learning about rainbows? Share your ideas with me in the comment section below. I love to hear from you!